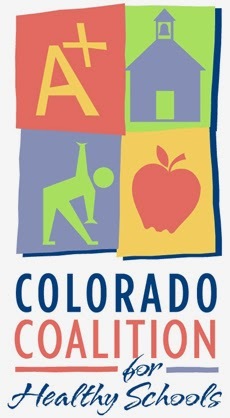 The next Colorado Coalition for Healthy Schools meeting will be Friday, June 6, 2014, from 8:30 a.m. to Noon at the Adams 12 Training Center, 1500 E 128th Ave, Thornton, CO 80241. Registration will open at 8:00 a.m. A light breakfast will be provided. Describe efforts and resources from Hunger-Free Colorado including school-based solutions to support student access to affordable, nutritious food. Identify a district example of utilizing multiple resources for a coordinated approach to Healthy Schools and for outreach campaigns/programs to reach diverse populations. Explain the status of the "Healthy Schools Collective Impact" work and list opportunities to get involved. Connect with others supporting healthy schools initiatives.